After recording 1984's Hyæna album with Robert Smith of The Cure in the guitars, it was only a matter of time before Smith would focus on his own band again, effectively ending his tenure as a Banshee guitarist. Siouxsie herself has often brought up the band's unfortunate luck with their guitarists - they just kept losing them, one after another. The next guitar-wielding Banshee, John Valentine Carruthers was actually the band's sixth one in only eight years. After Carruthers joined the group, they decided not to write a new album straight away, but to record an EP consisting of revamped versions of their older songs. 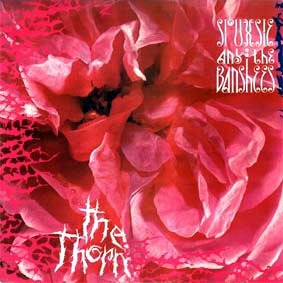 On the one hand, the Banshees - whose core now firmly consisted of the holy trinity of Siouxsie, Severin and Budgie - wanted to use the EP as Carruthers' induction to the band, and on the other hand, experiment with string arrangements and re-record some older songs that had evolved into new versions on tour. In brief, that is what The Thorn is - a four-track collection of early Banshee songs recreated with new string arrangements. Of these four tracks, two songs were previous album tracks ("Overground" from 1978's The Scream and "Placebo Effect" from 1979's Join Hands) whereas the other two had appeared as B-sides for single releases ("Voices (On The Air)" and "Red Over White" for "Hong Kong Garden" and "Israel", respectively). So they didn't go for the usual 'best of' route when choosing the songs, which is brilliant. And while the selection is a satisfying one, in hindsight, it would've pleased me terrifically if "Icon" from Join Hands had also made an appearance - the first time I heard the song, I couldn't help imagining it in an Enya-esque orchestral version. Not that the song needed it, though. All the songs profit tremendously from their new adaptations. Originally an experimental post-punk tune with a peculiar time signature, "Overground" - also released as a single from the EP - becomes a regal orchestral anthem that magnificently kicks off the record. "Voices (On The Air)", that was a minimalistic, eerie B-side of their debut single, becomes equally reinvigorated due to the revamping. It must be noted that while large part of the change comes from the string arrangements and altered instrumentation, it is also highly notable how much the band - or more precisely, the Siouxsie/Severin core of what was left of it - has evolved as well: gone is the slight fumblingness of their early years, and the band can now be heard playing very confidently and skillfully. Siouxsie's vocals have also developed immensely: her singing is more mature, more expressive, and just generally a whole lot stronger. The six years after their debut album had certainly taken the band to a whole new level. Out of the four, "Placebo Effect" was probably the one that least needed a makeover, considering it was a pretty solid tune to begin with. Nonetheless, its Thorn version becomes even more theatrical with its lowered pitch and majestic arrangements, becoming a brilliant 80s darkwave rocker. On the contrary, the final song "Red Over White" was possibly most in need of a remake - the 1980 version, albeit deliciously bizarre, sounds awfully unfinished. Here, however, it's redeemed by a most epic rendition. Come on, if you have Siouxsie singing about "The woods and the town, covered in snow / All transformed to a fairytale" but to a twisted kind of a fairytale where there's suggested to be blood running over the white pristine snow, this is the backdrop it deserves. Also the vocal style Siouxsie opted for on the track is much more fitting, with her narrating the story in a fatal-sounding voice, even screaming like a wicked witch towards the end. A very Banshee finish for the splendid EP. So, it is a success. Even though it was mostly just a stepping stone for the band, a way to integrate a new member before a proper album, it is an amazing example of how creative the band could get with their music, also showing that the Banshees plus the strings is never a disappointing combination, as shown before by the "Fireworks" single and the experimental A Kiss In the Dreamhouse album. The song selection is excellent, as mentioned before, since the band picked some of their lesser-known numbers instead of just going for the easy route and bringing back past hit singles. Funnily enough, most of their stuff would've probably translated into majestic string versions quite easily, so they could've basically chosen anything and made it sound brilliant. (And now I'm just imagining new orchestral versions of "Premature Burial", "Desert Kisses" and "Suburban Relapse". Well, a boy can dream...) The Thorn EP is quite the treat for any Banshees fans out there and solid enough to stand out on its own, as well. In other words, familiar with their music or not, do check it out! Try at least: Anything. Everything. It's only 4 tracks, mind you!